The Cotswold Way is a long distance walk running for around 170 km through southwest England from Chipping Campden at its northern end to Bath in the south. Most of the walk lies within the county of Gloucestershire. Emmy and I completed it in nine days, each one-day stage averaging around 20 km in length, with a one-day rest in Painswick halfway along the trail. 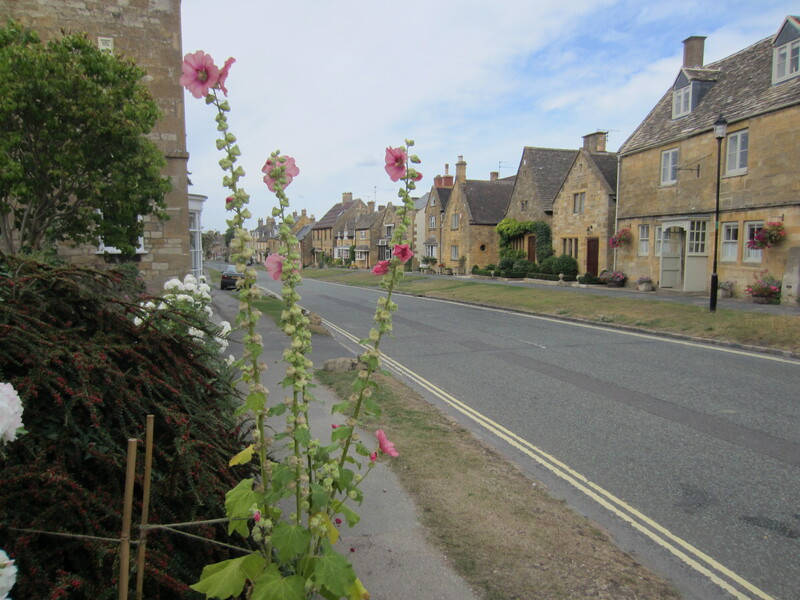 The main street of Broadway, half a day into the Cotswold Way walk. 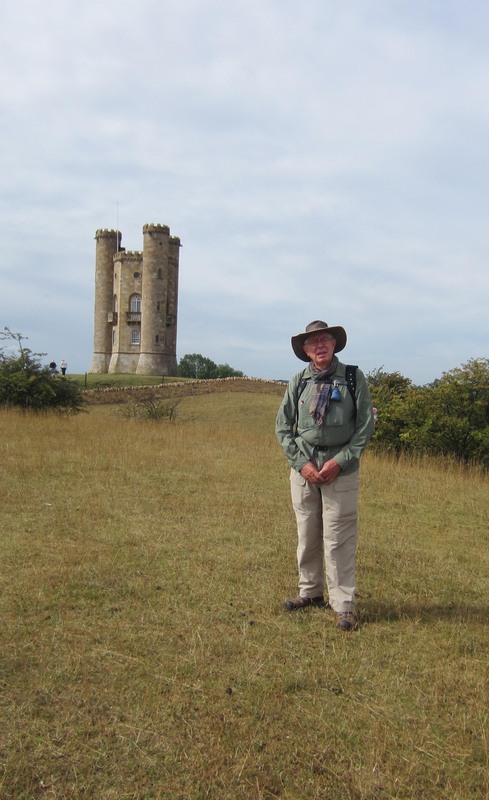 The Cotswold Way is not a difficult walk. There are no mountains or stretches of wilderness, and only a small part of it piggy-backs on highways or runs through urban areas. Most of the terrain is undulating countryside. There are several long steep climbs that will get you puffing hard, and because you walk five or six hours a day it demands a reasonable level of fitness. It is well way-marked but it is nevertheless possible to lose your bearings, as we did a couple of times. A good map and guidebook – better still, a GPS device – are essential. Some parts of the walk run through areas that are about as distant from services as it is possible to get in densely populated England, yet every night we slept comfortably in small guest houses or B&Bs and we ate well, mostly in village pubs. We used Macs Adventure, a Glasgow based company (http://www.macsadventure.com/cotswold-way/overview.php), to arrange our accommodation and transport our heavy luggage from stopping-point to stopping-point. They did an excellent job. 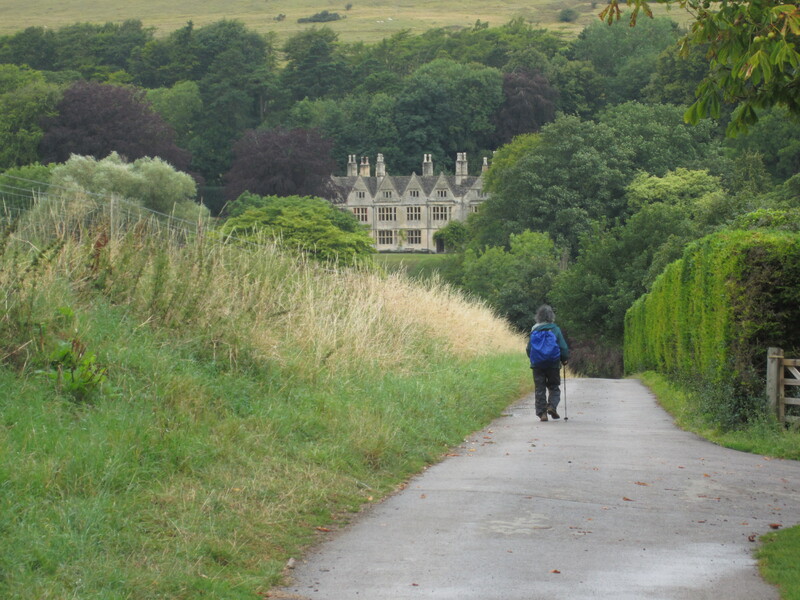 The Cotswold Way is no ordinary walk. It is more like a hymn sung by the feet in the great cathedral of the English countryside. This metaphor is way way over-the-top, I know, but in the after-glow of completing the walk, I like it. The contours of the hills, the rise and fall of the path, the beat of hedgerows, gates and farmsteads, the refrain of stone villages, and above all the grand melodic sweep of the panoramas, all come together in a beautiful fugue that commands the walker to join in. Like a musical composition, the Cotswold Way is wholly artificial and mannered. Its pastures and hedgerows, its cobbled villages, its stone towns sliced by narrow streets, even its woodlands and streams – everything is man-made. Centuries of cultivation have stamped and moulded every hedgerow, every copse has been manicured to its present shape, every meadow laid down by human hand. Every wall, no matter how mossy and “natural”, has been assembled stone by stone, every building has been cut and crafted and re-crafted often over many generations. A typical rural panorama along the Cotswold Way. Postlip Hall, a rural mansion near Winchcombe. 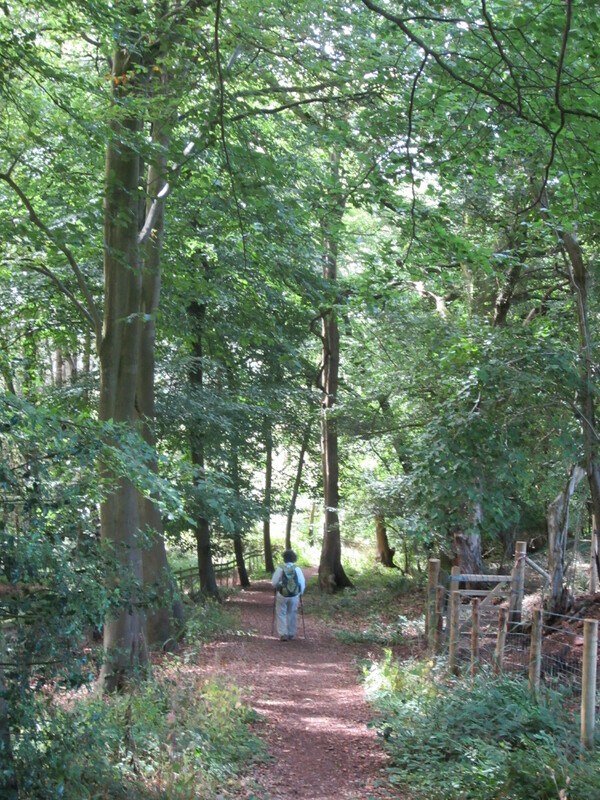 In short, on the Cotswold Way you will not be alone. When you walk it you join an invisible crowd. Like a stadium or cathedral, the Cotswolds are a giant, echoing amphitheatre whose seats are filled with the ghosts of countless human lives. You walk as an act of homage. Each day your steps sing a quiet day-long paean of admiration and gratitude to those who made the spectacular beauty you can now enjoy. Chipping Campden’s old livestock market. Its rough floor still smells of sheep and cows. 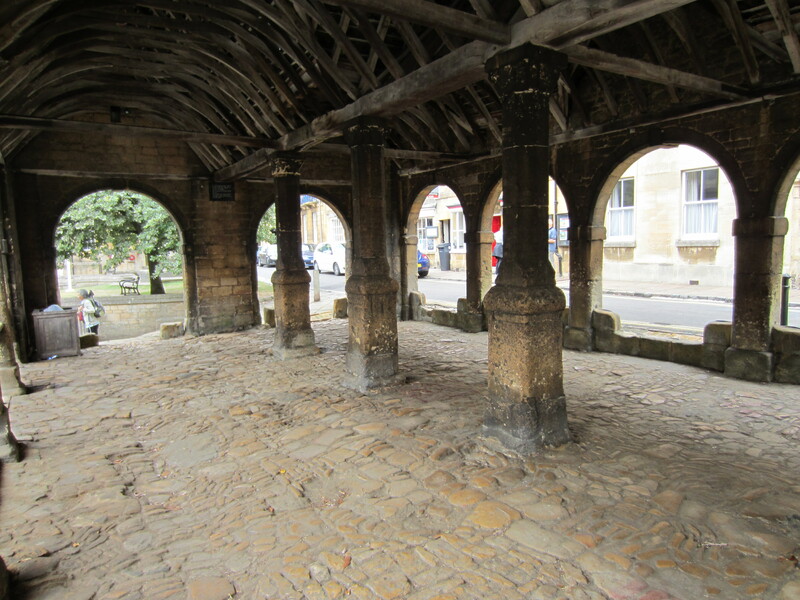 If you are walking from north to south (it is equally possible to walk the Cotswold Way from south to north) you start in the old livestock market in the centre of Chipping Campden. Peering out past the building’s columns and arches you take in the remarkable kilometre-long double rank of honey-coloured stone houses that line the main street. They haven’t changed much in the centuries since they were built. Even the roughly cobbled floor of the market building is still exactly as it was 200 years ago. In fact, although the livestock market has not been used as a market for at least a century, if you kneel down (as I did to take a photograph) you inhale the faint acrid odour of animal urine and dung still sweating from the stones. 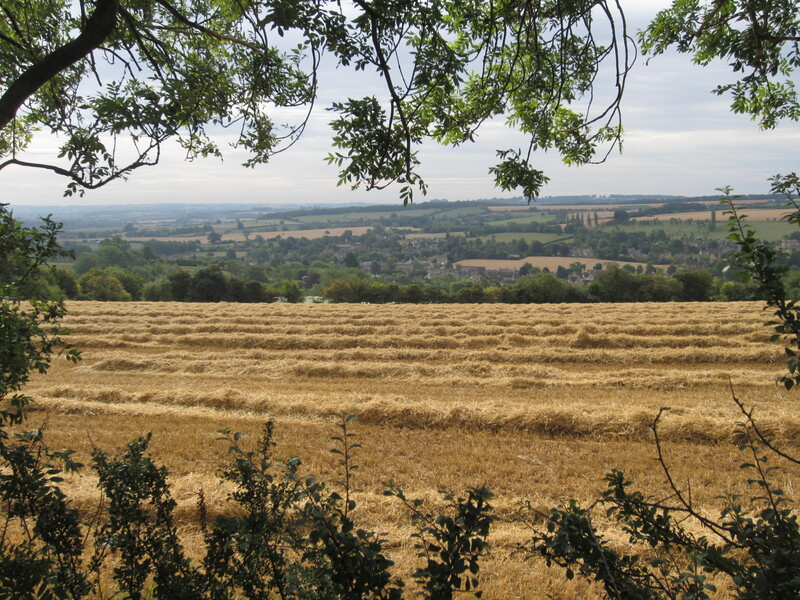 To me, it felt like Thomas Hardy’s home ground, where (in my mind’s eye) Michael Henchard, the mayor of Casterbridge, might once have cut deals in corn and hay and sheep. 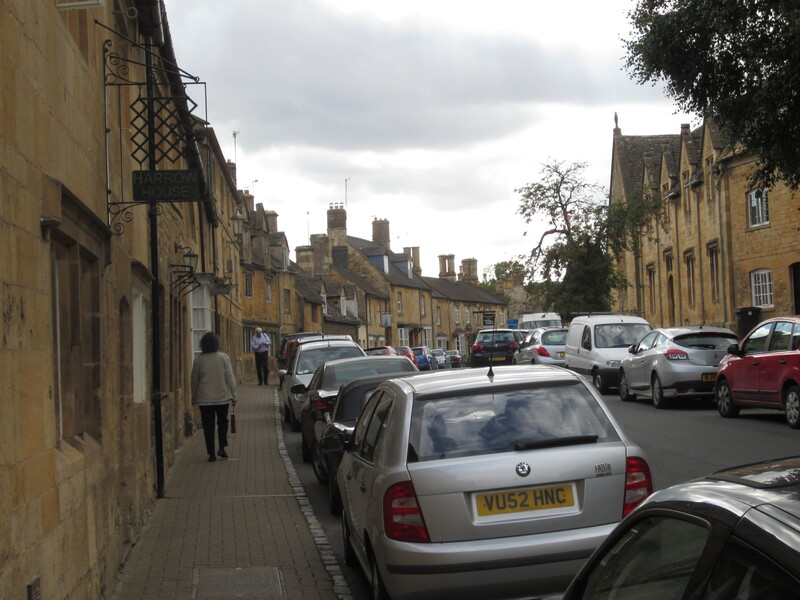 The remarkable main street of Chipping Campden. It was the production and export of wool in the 17th and 18th centuries that created Chipping Campden’s prosperity. When that trade declined in the 19thcentury it froze the town, and other nearby towns, in the time capsule that we see today. History ambushes you at every stage of the walk, from Belas Knap prehistoric burial mound, to the extravagances of Regency architecture (1790 – 1830), to aristocratic follies like Broadway Tower (1799), to the lonely memorial that commemorates the life of William Tynedale (1494-1536), the brave man who first translated substantial portions of the Bible into English for the general public, and whom a grateful and merciful Church executed by strangulation and burning at the stake. Gloucestershire was a major theatre of combat during the first English Civil War (1642 – 1646) changing hands several times. In Chipping Campden a large manor house abandonned by a royalist supporter still stands derelict 350 years after it was scuttled by its owner. Further south the walk passes across the quiet fields of Lansdown where a bloody but inconclusive battle was fought between royalist and parliamentarian forces in 1643. Broadway Tower, built for no special reason by a dotty aristocrat. Today it is a tourist attraction and a welcome stopping point for tired walkers. Emmy and I headed out of Chipping Campden on the fresh, warm morning of August 17th. The first day gave us a synopsis of the route to come: pasture, wooded hills, hedgerows, gates, and vast, faintly whispering vistas of England’s park-like countryside. It was a world of green, punctuated by villages and small towns clustered around church spires, their glowing stone houses embedded in bright flowers. We stopped for a lunch of pumpkin soup and scones in a traditional tearoom in the town of Broadway and we slept a peaceful night in the wonderfully welcoming Shenberrow Hill B&B under huge trees in the picturesque stillness of Stanton village. A house in the village of Stanton. Thatched roofs are becoming rare, but the honey-coloured stone is the most common building material in this part of the Cotswolds. The following two days took us along the escarpment that skirts the eastern extremities of Cheltenham, a major city that we could see laid out below us in the distance. Here, on a Saturday morning, we had to wade into a strong current of dogs. On day-release from high-walled back yards and dark cells in their city apartments, they had dragged their owners up the escarpment and on to the Cotswold Way. Tiny hair balls on four legs yipped along beside drooling monsters with flapping jowls and turkey necks. The dogs washed around us with remarkable politeness. We met two young women surrounded by a slobbering, panting mini-tribe. 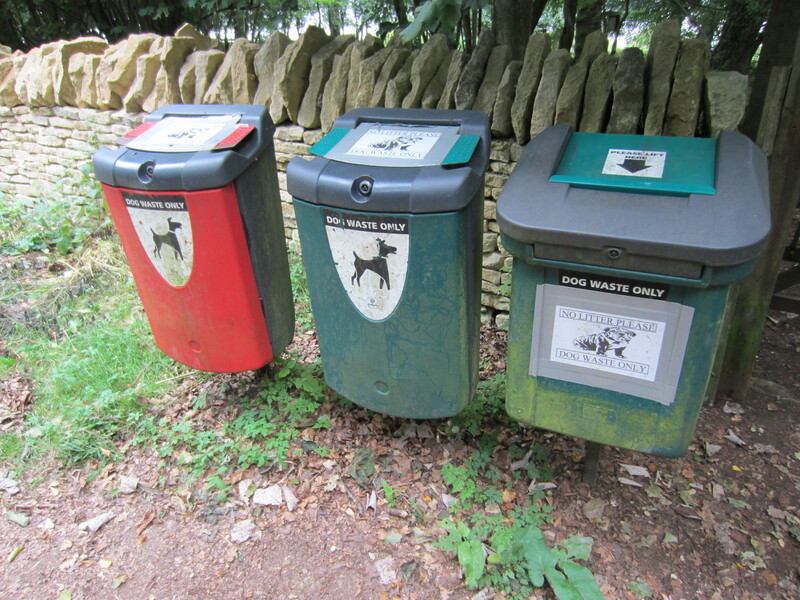 Special bins for the disposal of dog poo. Notice… not one bin, but three. How many dogs does it take to fill three bins with poo? Go figure. Madge – a yellow, long haired labrador – slunk guiltily out of the bushes and headed for what looked like a row of three rubbish bins. We had seen these at several points along the Cotswold Way. They were special receptacles for dog waste. Madge started pawing the grass beside them. Her owner produced a plastic supermarket bag and waited fondly as Madge revolved in circles sniffing the ground. She was indeed a very well-mannered dog. For the most part, the English have taught their dogs to be as polite and ordered and friendly as the human population is. But always, in one way or another, the essential dogness of dogs will overrule efforts to fully humanise their behaviour. When we arrived at our B&B accommodation in Painswick – an atmospheric and comfortably lived-in 17th century townhouse – we found two large dogs stalking the stone floors. They were short hair, blue-grey dogs, thin, gaunt and perfectly polite. Their main interest in life was scheming to get out of the house. As soon as they realised we could not help them they stopped trying to ingratiate themselves with us and disapppeared. The next morning as we sat down to breakfast our hostess was apologetic. The two dogs were sitting by the front door hoping their crime would get them expelled from the house. Our hostess called to her daughter. Instantly the two dogs thumped their tails on the floor. Success! 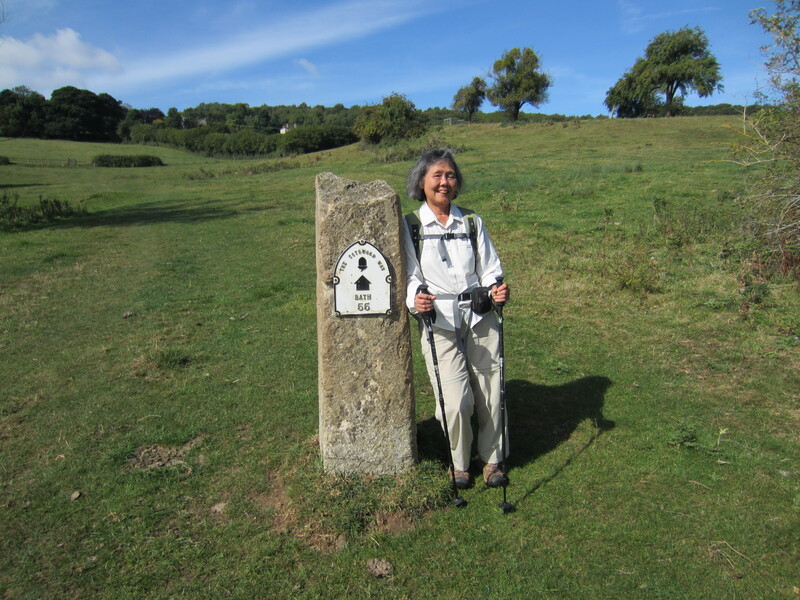 Just south of Painswick we reach the Cotswold Way’s halfway point, 55 miles or 88 km into the walk. How does Australia look after all of this? I’m missing Europe already, but Australia looks great, Lois. Canberra is cold, but daffodils are running amok in our back garden.